Clinical studies confirmed that microinfarction occurs in almost 1/4 of patients undergoing coronary intervention. There has been extensive debate about the etiology, mechanism and significance of microinfarction. To directly and indirectly detect 1) discrete nonperfused myocardium induced by embolic agents using first passage perfusion, 2) hyperenhanced microinfarction on delayed contrast enhanced MRI (CE-MRI) and 3) changes in LV function. Embolic agents between 100–500 μm were used to induce myocardial microinfarction in swine (n = 6). This was performed to simulate the clinical scenario, where different sizes of debris and thrombus scatter downstream from coronary plaques. All studies were performed in hybrid XMR suite (Philips Medical Systems). X-ray fluoroscopy was used for catheterization. The embolic agents were selectively injected into either LAD or CX coronary arteries. MR imaging was used for direct and indirect visualization and assessment of microinfarction, respectively. Figure 1 shows the perfusion territory prior to delivery of the embolic agents. Tissue samples were assessed microscopically. X-ray fluoroscopy shows the site of delivery (arrowhead) of embolic agents in CX (arrow). 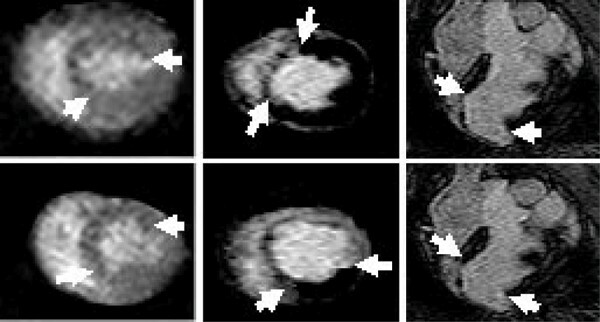 CE-MRI shows CX perfusion territory prior to delivery of the embolic agents (A). After delivery, first pass perfusion showed the embolized region as hypoenhanced (arrows, B) and discrete hyperenhanced subregion (C, D) on CE-MRI. Discrete microinfarction, visualized on CE-MRI, can be directly linked to LV dysfunction. Additionally, it causes progressive decline in LV function. The observed changes are similar to that observed in ischemic cardiomyopathy. Microembolization resulted in a large variation in the sizes of resulting microinfarction on first pass perfusion and CE-MRI (Figures 1, 2). The underlying mechanisms for different hypoenhanced and hyperenhanced microinfarction sizes are: 1) clustering of injected embolic agents, 2) branching geometry of the coronary vessels is not symmetrical and 3) adjacent arterioles occluded. The effects of the embolic agents were also detected indirectly using cine and tagging MR imaging. The embolic agents produced persistent decline in systolic wall thickening in both embolized (40% at baseline to 3% at 1 hr and 3% at 7 days) and remote myocardium (37% baseline to 20%% at 1 hr and 17% at 7 days). The decline in regional function was associated with substantial reduction in ejection fraction (57% baseline to 22% at 1 hr and 41% at 7 days). 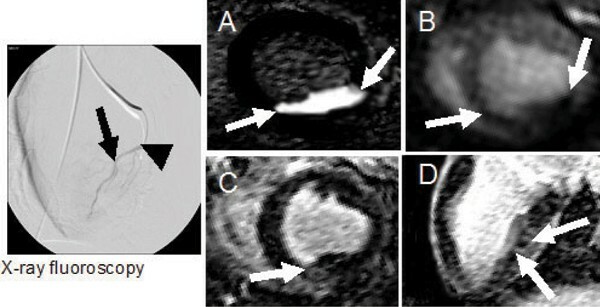 Multislice MR images show the heterogeneous embolic region during first pass of Gd-DOTA (left), and delayed enhancement in short (center) and long (right) axis views 7 days after delivery of the embolic agents. Microscopic examination revealed presence of the embolic agents in various sizes of coronary arteries. The embolic agents are clustered within the vascular lumen. Adjacent myocytes show discrete early ischemic damage, denoted by dark purple discolorization, as shown on Masson's trichrome stain in the acute phase (9 hr post delivery). Subacute microinfarction (7 days) has been partially healed. The obstructed vessels showed evidence of inflammation and thrombi formation (Figure 3). The core of the embolic territory showed necrotic myocytes and the margin granulation tissue. Histological sections show partially healed microinfarction 7 days after delivery of the embolic agents (left panel, arrows 40×). The center of the infarct is comprised of necrotic muscle (I) and the margin granulation tissue (G), indicating the start of the repair process. The embolic agents are shown occluding a vessel and associated with organizing thrombus (T) (100×). Discrete microinfarction, visualized on CE-MRI, can be directly linked to LV dysfunction. Additionally, it causes progressive decline in LV function. The observed changes are similar to that observed in ischemic cardiomyopathy.